(Bloomberg) — China is speeding up efforts to design and build a manned deep-sea platform to help it hunt for minerals in the South China Sea, one that may also serve a military purpose in the disputed waters. Authorities recently examined the implementation of the project and decided to accelerate the process, according to the presentation. So far there are few public details, including a specific time line, any blueprints or a cost estimate — or where in the waterway it might be located. Still, China under President Xi Jinping has asserted itself more strenuously in the South China Sea, one of the world’s busiest shipping routes. 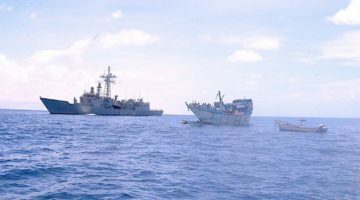 Its claims to more than 80 percent of the waters and the creation of artificial islands covering 3,200 acres have inflamed tensions with nations including Vietnam and the Philippines. It has also led the U.S. to send ships from its Seventh Fleet to ensure freedom of passage through an area that carries $5.3 trillion of global trade a year. To read more about the diplomatic tussle over the South China Sea, click here. “The deep sea contains treasures that remain undiscovered and undeveloped, and in order to obtain these treasures we have to control key technologies in getting into the deep sea, discovering the deep sea, and developing the deep sea,” Xi said last month at a national science conference. While China’s appetite for natural resources remains the driving force behind the project, the recent ministry presentation noted the platform would be movable, and used for military purposes. China has proposed a network of sensors called the “Underwater Great Wall Project” to help detect U.S. and Russian submarines, say analysts at IHS Jane’s. “To develop the ocean is an important strategy for the Chinese government, but the deep sea space station is not designed against any country or region,” said Xu Liping, a senior researcher for Southeast Asian affairs at the Chinese Academy of Social Sciences, a government-run institute. When analysts look at the South China Sea, they tend to focus on the potential for oil and gas reserves as estimates for mineral deposits are sketchy. The U.S. Energy Information Administration says the area has proved and probable reserves of about 11 billion barrels of oil and 190 trillion cubic feet of natural gas. China’s estimates dwarf those. In 2012, Cnooc Ltd.’s then-chairman estimated the area holds around 125 billion barrels of oil and 500 trillion cubic feet of natural gas. While most of the undiscovered oil lies in coastal regions that aren’t disputed, the contested areas face geological and technological challenges, not least the depth of the waters and frequency of typhoons. Spearheading the planning for the deep-sea station is the China Shipbuilding Industry Corporation, according to a statement on the website of the science ministry. Once operational, it would host dozens of crew members who could remain underwater for up to a month, the ministry’s presentation separately said. China Shipbuilding Industry Corporation and the ministry did not reply to faxes seeking comment. Planning has been under way for a decade and is central to China’s push to become a global technology superpower by 2030, according to the presentation. Completing it would help China close a deep sea exploration gap with the U.S., Japan, France and Russia on underwater technology. China has already logged successes, with its Jiaolong submersible setting a world record by descending 7 kilometers in 2012. The ministry presentation didn’t give any estimated price tag but Bryan Clark, who formerly served as special assistant to the chief of U.S. naval operations, said the cost could be daunting and its vulnerability to detection would make it less attractive militarily than using a submarine or an unmanned vehicle. China spent 1.42 trillion yuan ($216 billion) on state and privately-funded research and development in 2015, according to the National Statistics Bureau, while total defense spending this year is projected by the government to increase 7.6 percent to 954.4 billion yuan ($145 billion).